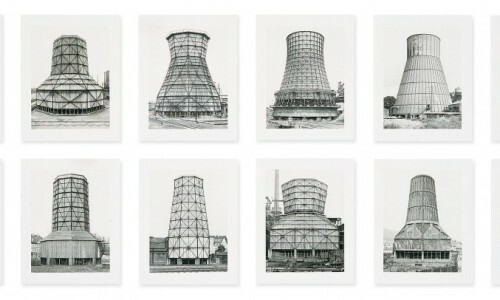 Cities are the manifestation of the cultural, economic and social acceleration that we have experienced in our modern history. In 1950 about 2/3 of the population worldwide lived in rural settlements and 1/3 in urban settlements. By 2050, we will observe roughly the reverse distribution, with more than 6 billion people living in the messy, burgeoning athmosphere of urbanized areas. According to the Sustainable Urbanization Policy Brief, urban centres currently occupy less than 5% of the world’s landmass. Nevertheless they account for around 70% of both global energy consumption and greenhouse gas emission. Innovation in urban infrastrucure and technology is essential when addressing this issue. For instance, greenhouse gas emissions could be reduced by up to 1.5 billion CO2e annually by 2030, primarily through transformative change in transport systems in the world’s 724 largest cities. Urban planning decisions and strategic design thinking in the context of rapid urbanization account for social equity, mobility patterns, global competitiveness and energy-efficiency. 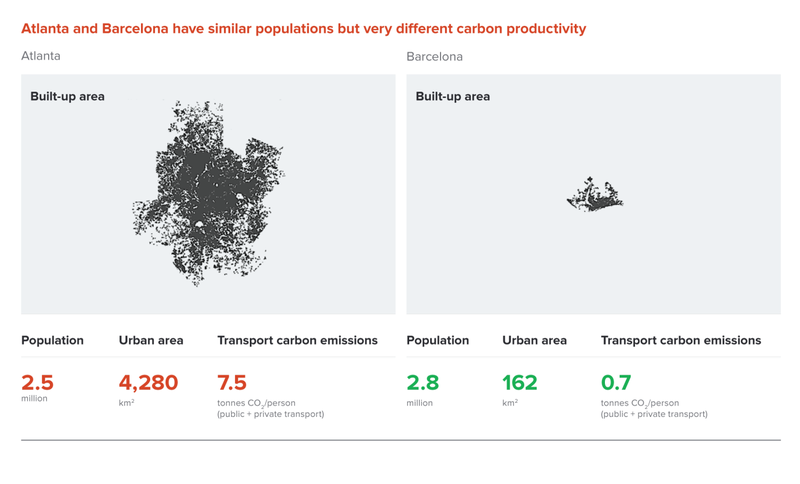 In that sense a brief comparison between Atlanta and Barcelona shows at a glance that cities with similar populations can have very different carbon emissions, depending on how the urban layout is conceived. With urban area of 4,280 km2, Atlanta’s carbon emissions are ten times higher than those in the city of Barcelona, whose built-up area is 162 km2. 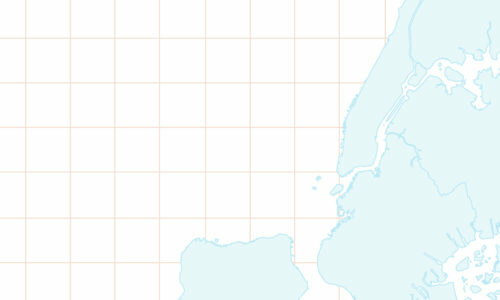 Both cities have population of about 2.5 million people. As densities decline, city areas grow faster than city populations  and affect environmental sustainability at a local, regional and global scale. How we manage this unprecedented urban growth in the following years is likely to determine the outcome of our sustainability endeavours. Between now and 2050, 90% of the expected increase in the world’s urban population will take place in the urban areas of Africa and Asia  . In other words the projected urban growth will be concentrated in cities in the developing world where the correlation of the rate of urbanization with economic growth has been weaker. The global trends of urbanization in the first decades of the 21st century are significantly different from what we have experienced so far in terms of urban transition. Urbanization is taking place at lower levels of economic development and the majority of future urban population growth will take place in small- to medium-sized urban areas in developing countries. Expansion of urban areas is on average twice as fast as urban population with significant consequences for greenhouse gas emissions and climate change. 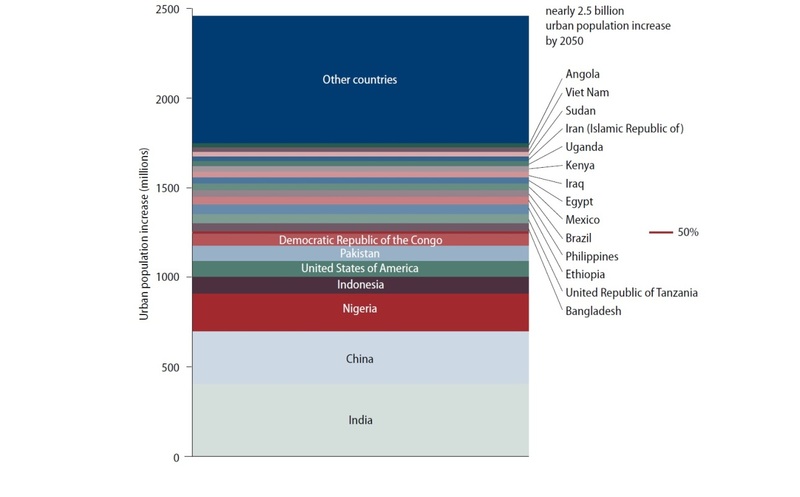 Continuing population growth and urbanization are projected to add 2.5 billion people to the world’s urban population by 2050, with nearly 90% of the increase concentrated in Asia and Africa. The fastest growing urban agglomerations are medium-sized cities and cities with less than 1 million inhabitants located in Asia and Africa. Most megacities and large cities are located in the global South. Just three countries — India, China and Nigeria – together are expected to account for 37 per cent of the projected growth of the world’s urban population between 2014 and 2050. India is projected to add 404 million urban dwellers, China 292 million and Nigeria 212 millions. Close to half of the world’s urban dwellers reside in relatively small settlements of less than 500,000 inhabitants, while only around 1/8 live in the 28 mega-cities with more than 10 million inhabitants. The number of mega-cities has nearly tripled since 1990; and by 2030, 41 urban agglomerations are projected to house at least 10 million inhabitants each. Tokyo is projected to remain the world’s largest city in 2030 with 37 million inhabitants, followed closely by Delhi where the population is projected to rise swiftly to 36 million. Urban scaling holds both the key to long-term sustainable development and irreversible damages to our planet. The expected increase in urban land cover during the first three decades of the 21st century will be greater than the cumulative urban expansion in all of human history . These unprecedented rates of urbanization put enormous pressure on environmental sustainability thresholds and indicators. Tackling strategic components of urban form such as density levels, land use patterns and connectivity will have a major impact on the global economy and climate. The New Climate Economy Report. 2014. Bertaud, A. and Richardson, A.W., 2004. Transit and Density: Atlanta, the United States and Western Europe. United Nations, Department of Economic and Social Affairs, Population Division (2014). World Urbanization Prospects: The 2014 Revision, Highlights (ST/ESA/SER.A/352). It helped he to complete my assignment ……..
it helped me to complete my assignment…/.. Very helping.. to add up of environment issue is nice …it can be made better with adding more data with more countries …. I have to do my assignment on the topic of Trends of urbanization in Pakistan before and after Revolution by percentage….